Editor's note: This story has been updated to reflect new information received about Will Rogers' health insurance status. For Lexington resident Eddie Richardson, life hasn’t been the same since Aug. 1, 2016. 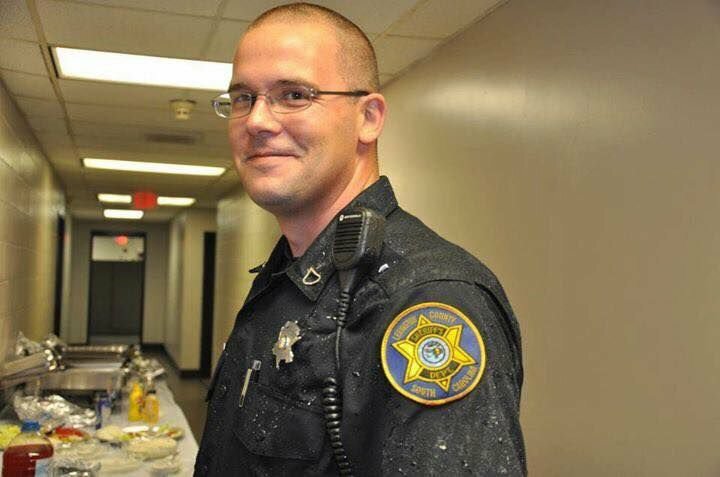 Then a Lexington County Sheriff’s Office master deputy, Richardson was ambushed by a suspect who rammed a vehicle into him. He was left with spinal damage, a dead nerve in his right leg and torn cartilage in his hip — injuries that meant he’d never work in law enforcement again. But the biggest challenges were yet to come. While he receives some retirement pay through the state and disability pay through workers' compensation, Richardson said his health insurance was canceled and his seven years with the sheriff’s office don’t qualify for county retiree insurance. The lowest-cost plan on the private market is $12,000 annually and has a $3,000 deductible, an amount far too high to afford, he said. "I'm in a position where I can't work for it, I can't pay for it, and they won't give it to me," Richardson said. "It's an everyday panic attack of how are we going to pay for things. It's literally crushing. It's mentally crushing, how much stuff is left up to chance." According to injured officers across the country, and the nonprofits and other groups that are working with them, too many find themselves in Richardson's shoes. Without help, many face a long struggle to get the care they need. Advocates say many law enforcement officers struggle to pay bills and make ends meet after they’re injured so badly that they can’t return to work. No official figures exist on how many officers fall into that category, and that lack of information makes it difficult to address the problem, according to representatives of Code 3, a national nonprofit that helps officers. Dale Sutherland, the nonprofit's founder and president, spoke before a U.S. Senate Subcommittee on Crime and Terrorism panel that was led by Sen. Lindsey Graham on Jan. 17. "It is possible for a police officer to sustain a career-ending injury on the job in one state and receive adequate disability and medical benefits, while an officer who sustains the exact same injury in another state receives meager benefits and struggles to make ends meet," Sutherland testified. Tracking disabled public safety officers and their quality of care and benefits. Creating federal guidelines for minimum standards of care for all permanently disabled public safety officers. Getting Congress to consider making additional support available for permanently disabled officers who were injured early in their careers. Encouraging the Public Safety Officers Benefits program and other data-collection programs to work with nonprofit and private organizations to raise awareness of the issue and develop a platform for private donations to help injured officers. "We're going to keep going to Graham, as well as other members (of Congress), to keep pushing for legislative policy," said Joe Abdalla, the nonprofit’s executive director. "I don't think that the federal government should hesitate." Sutherland said Code 3 plans to help officers until the government develops and implements a better plan, but that process could take years. Although Richardson continues to struggle to make ends meet, he is happy that he was the officer who responded to the scene where he was ambushed. "I took the call for one of my guys who was a rookie," he said. "I know I made it out and didn't put my guy at risk. My guys are still out there, working." After his injury, Richardson found an online community of thousands of injured cops that has helped him cope with what happened and made him understand that he's not suffering alone. Pete Tanzilli, a former officer in New Mexico who now lives in Denver, founded the Facebook peer support group “Officer Down-We Survived” after he was shot while trying to apprehend a suspect in 2016. Tanzilli said he's connected with thousands of officers around the country and abroad who find themselves in similar positions: injured, unable to return to work, without insurance and unsure of how to navigate the benefits system. A career-ending injury is one of the worst things an officer can suffer, but the online community has provided invaluable support, he said. Will Rogers, a former Berkeley County Sheriff’s Office captain who was injured in the line of duty, is also working with Code 3 and hopes to bring national awareness to the issues faced by first responders like him. In January, he joined the nonprofit in Washington D.C. and provided written testimony to the subcommittee. On May 14, 2015, he was working as a shift supervisor with the sheriff's office when he pulled into an Exxon gas station at U.S. Highway 52 and Cypress Gardens Road around 10:30 p.m. A lieutenant at the time, Rogers was talking to a customer when a masked man came from behind the building and shot him in the head. He survived but was forced to give up a 25-year career and was left with lingering vision problems, seizures and crushing headaches. Following the shooting, Rogers was faced with a lengthy recovery process and challenges with his benefits. He was denied Social Security disability benefits and experienced a gap in his county health insurance. His plan was canceled in August and was reinstated on Feb. 1. County Attorney John Williams said that Rogers gave up workers’ compensation benefits in favor of coverage under the county’s retiree health insurance program in June, but closed the bank account that his monthly premiums were being drawn from. Officials tried to alert Rogers but with payments stopped, the coverage lapsed, Williams said. When they learned in January that Rogers was without health coverage, county officials reached out to their insurance provider and arranged to have him put back on a plan, he said. "It was quite a process in getting them to agree," Williams said. "We are extremely grateful to Will Rogers for his service." The Post and Courier was not able to reach Rogers for comment on the county’s explanation. But during an interview in January, he and his fiancee, Sharon Whitley, said they now feel optimistic and have found a mission for the future. "There's a lot of officers out there who have been hurt or are going to be hurt and they're going to need assistance," Rogers said.